Of the 242 U.S. fishery species assessed by the Monterey Bay Aquarium Seafood Watch program, 95% of commercial landings have earned a “Best Choice” or “Good Alternative” recommendation as environmentally responsible seafood options. Seafood Watch upgraded many U.S. fisheries in 2013 based on new peer-reviewed science reports, including red snapper from the Gulf of Mexico, East Coast monkfish and trap-caught black sea bass, and many Atlantic flatfishes. Wild-caught shrimp from the Gulf of Mexico and South Atlantic remain a “Good Alternative” except when gear has not been modified to protect sea turtles and other species caught accidentally in shrimp nets, as mandated in federal waters. All shrimp caught in Louisiana or caught by “skimmer trawl” is now on the Seafood Watch “Avoid” list because of critical conservation threats to sea turtles. Seafood Watch regularly assesses wild-caught and farmed seafood based on peer-reviewed science reports and fully transparent criteria published on the Monterey Bay Aquarium website. The reports incorporate input from fishing interests, academic experts, and federal and state fishery scientists and managers – including information from NOAA’s Fish Watch. (October 7, 2013-Monterey, California) – U.S. fisheries are rebuilding under tough management regulations required under federal law. One sign of success: the growing number of seafood items that have earned a “Best Choice” or “Good Alternative” recommendation from the Monterey Bay Aquarium Seafood Watch program. In 2013 alone, red snapper from the Gulf of Mexico, monkfish and trap-caught black sea bass from the East Coast, and many Atlantic flatfishes have been upgraded, based on new data in the peer-reviewed science reports that underpin all Seafood Watch recommendations. October is National Seafood Month and today, 95 percent of the 242 most commercially important U.S. fishery species assessed by Seafood Watch are rated either green (Best Choice) or yellow (Good Alternative). The percentage is based on total landings in ports on the West Coast, Gulf Coast, Atlantic seaboard and in the Great Lakes. Seafood Watch recently upgraded U.S.-caught red snapper in the Gulf of Mexico to a “Good Alternative” recommendation because sound management has helped once-depleted populations recover. Trap-caught black sea bass from the South Atlantic was also upgraded to a “Best Choice” recommendation. A Seafood Watch assessment of the U.S. shrimp fishery in the Gulf of Mexico and South Atlantic released today (October 7, 2013) reaffirms that the U.S fleet is a global leader in addressing one of the most critical conservation threats facing sea turtles: bycatch of endangered and threatened turtles in shrimp trawl nets. The report concludes that most wild-caught U.S. shrimp remains a Good Alternative – except for shrimp from Louisiana or shrimp caught in nets that haven’t been modified to protect sea turtles and other species caught accidentally by shrimp boats. Alone among Gulf of Mexico and South Atlantic states, Louisiana prohibits enforcement of federal requirements to use Turtle Excluder Devices (TEDs), which have proved effective in reducing sea turtle deaths and allowing their populations to begin a slow recovery. Under a 1987 state law, Louisiana officials are forbidden from enforcing TED requirements in state waters, where most shrimp fishing occurs. “Even when conscientious Louisiana fishermen voluntarily comply with regulations that protect sea turtles, the state’s mandate not to enforce this essential measure creates a critical conservation concern and an ‘Avoid’ recommendation for all shrimp caught in Louisiana,” said Margaret Spring, vice president of conservation and science for the Monterey Bay Aquarium. Spring played a key role in crafting the Magnuson-Stevens Fishery Conservation Act, whose provisions are driving the recovery of fisheries in U.S. waters. 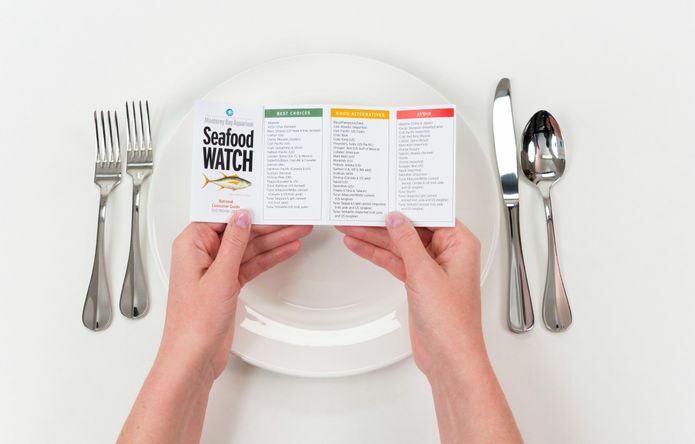 “Seafood Watch assesses wild-caught and farmed seafood based on peer-reviewed science reports and fully transparent criteria that we publish on the Monterey Bay Aquarium website,” said Seafood Watch Director Jennifer Dianto Kemmerly. “If there’s a change in Louisiana’s management of its shrimp fishery to address the critical conservation concern around sea turtles, we can quickly revisit our recommendations to reflect that change,” she added. In addition to using TEDs to protect sea turtles, Kemmerly said that most U.S. shrimp boats use bycatch reduction devices that play a vital role in the recovery of commercially important fish species, like red snapper, that would otherwise be accidentally killed in shrimp trawling gear. Bycatch reduction devices and TEDs are not required on the skimmer trawls used by some shrimp boats. Shrimp caught using skimmer trawls – a small fraction of total U.S. shrimp landings – also remains on the Seafood Watch “Avoid” list. A proposed federal rule to require TEDs in skimmer trawls was withdrawn in February 2013, and other mitigation measures provide too little protection for sea turtles or are poorly accepted by skimmer trawl fleets. Seafood Watch regularly assesses wild-caught and farmed seafood based on peer-reviewed science reports published on the Monterey Bay Aquarium website. The reports incorporate input from fishing interests, academic experts, and federal and state fishery scientists and managers – including information from NOAA’s Fish Watch. Seafood Watch reports and recommendations for all seafood items can be found online at www.seafoodwatch.org. 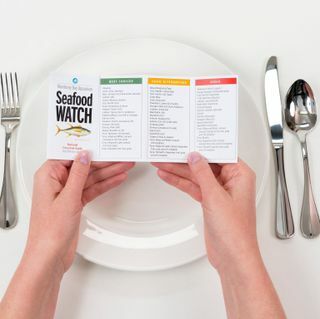 The “About Seafood Watch” pages detail the transparent assessment process and conservation criteria employed in developing seafood recommendations, http://www.montereybayaquarium.org/cr/cr_seafoodwatch/sfw_aboutsfw.aspx.